When Andoni Luis Aduriz opened Mugaritz in Errenteria back in 1998, he was one of the first elBulli alumni to strike out on his own. 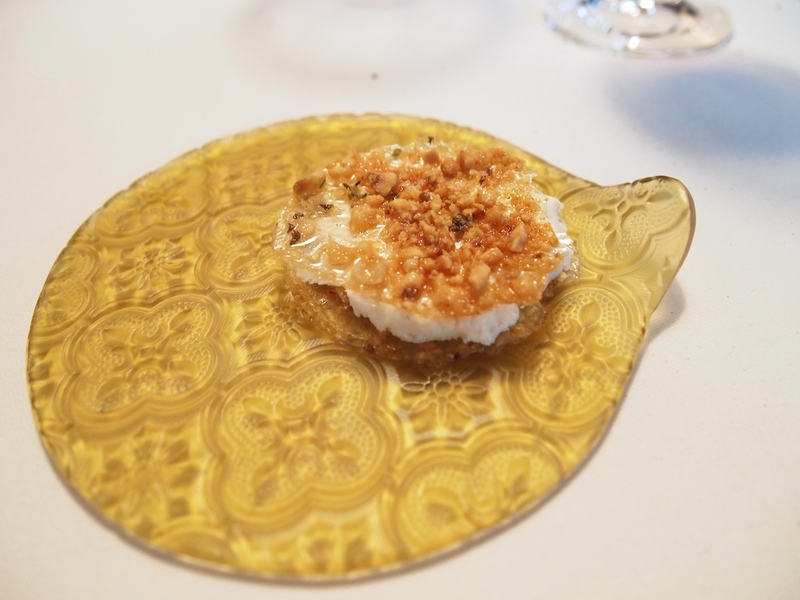 A couple of years after dropping out of catering college in San Sebastian, Andoni Luis Aduriz (b.1971) went to work for Ferran Adria at the then internationally still relatively unknown elBulli in Roses, Catalonia. Aduriz stayed there for 2 years (1993-1994), a period he describes as life-changing, "you could say elBulli freed my mind". Before opening his own restaurant, Aduriz was head chef for a year at Martín Berasategui's three-star restaurant in San Sebastian and he even briefly ran a cake shop selling coffee and sweet buns. 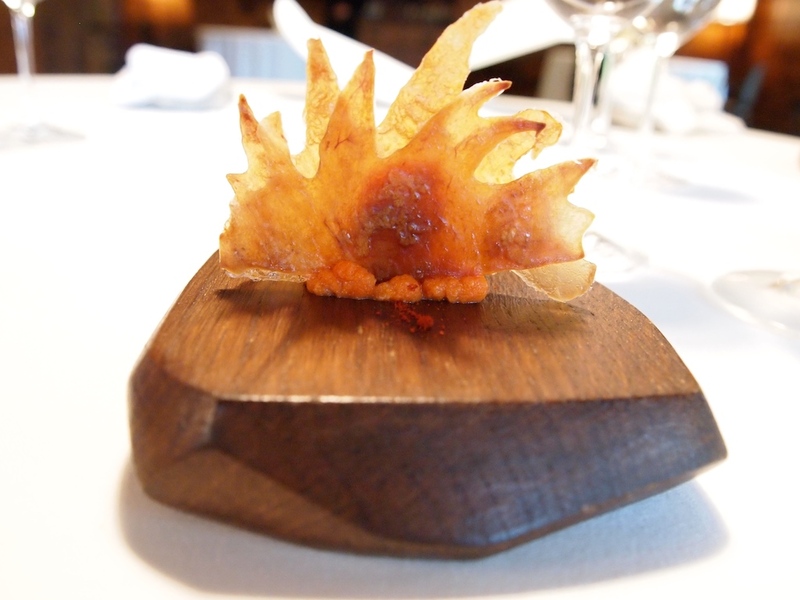 In 2000, two years after the opening, Mugaritz was awarded a Michelin star and the second star followed in 2005. 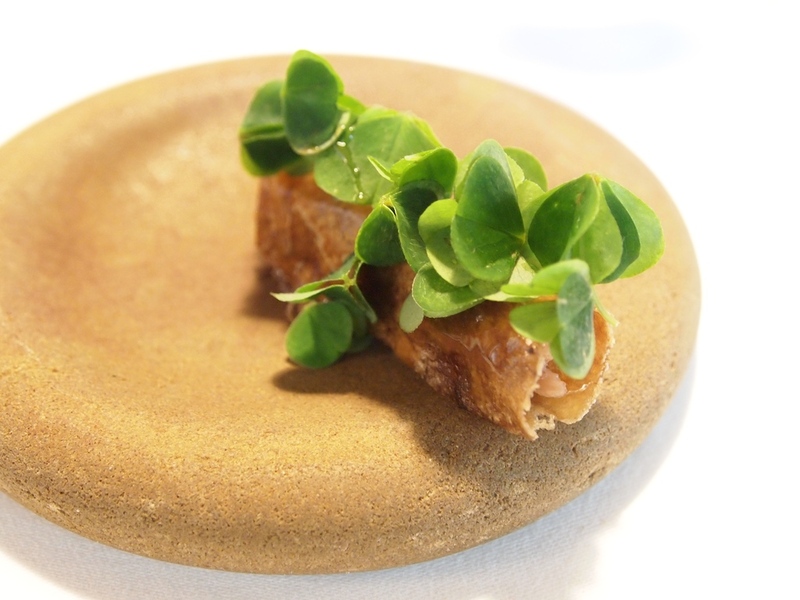 Mugaritz debuted at number 10 in the World's 50 Best Restaurants list in 2006 and the restaurant hasn't been out of the top 10 since, the highest position being number 3 in 2011 and 2012. 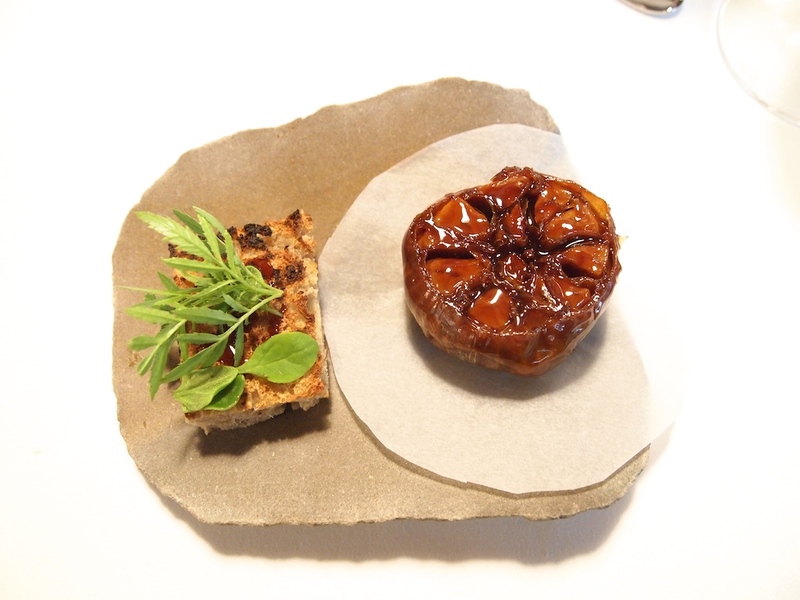 In the latest edition of the restaurant list Mugaritz takes up the number 6 spot. 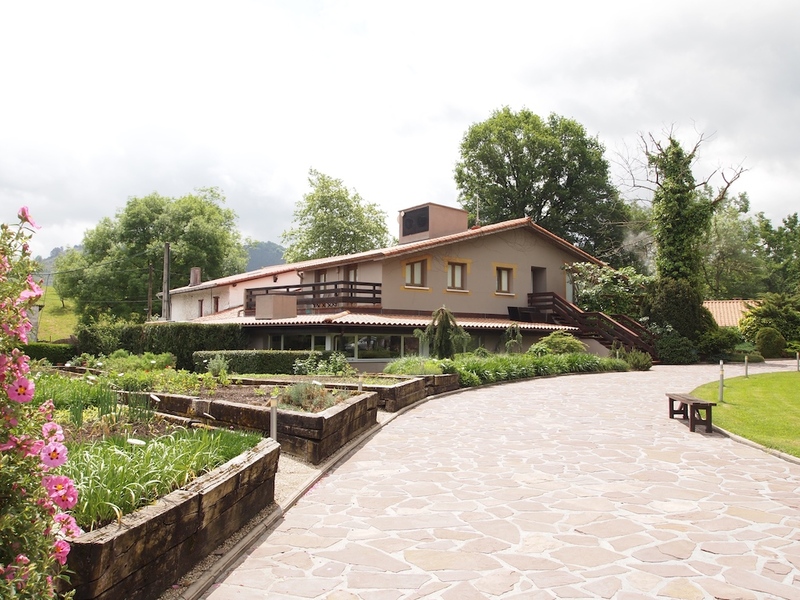 Mugaritz is open eight months a year, usually from April till December. The restaurant is open for lunch Wednesday through Sunday and for dinner Tuesday through Saturday. 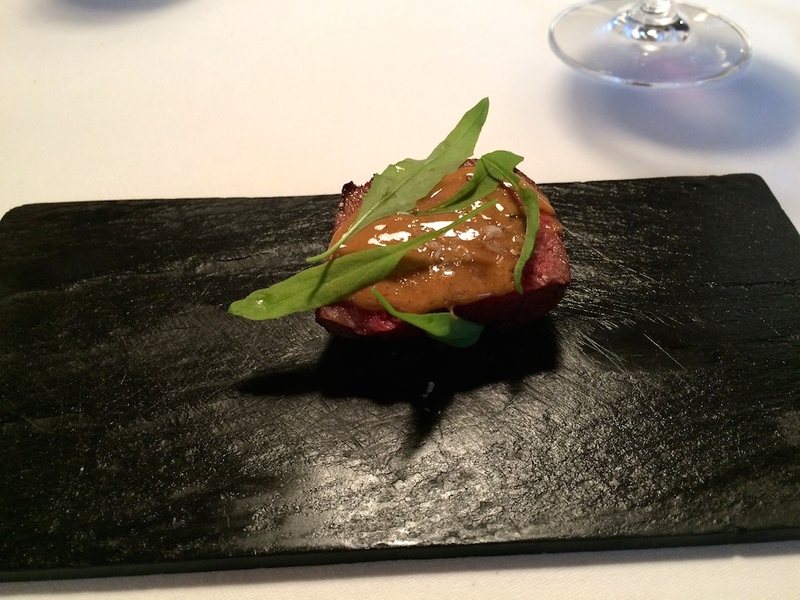 There is only one 24-course tasting menu on offer, currently priced at €185. 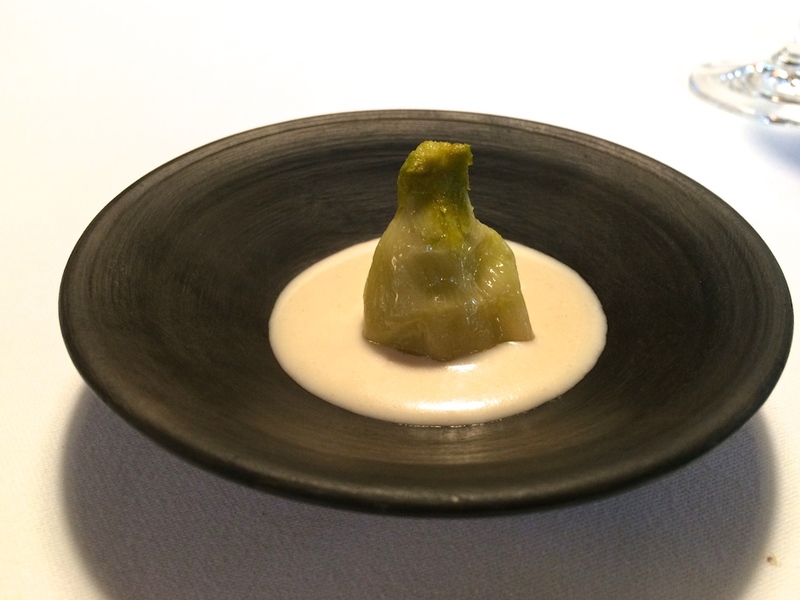 I had lunch with my husband and a friend at Mugaritz on Thursday 14 May 2015. After a drink in the courtyard, we were invited to the kitchen where head chef Ramón Perisé gave us a brief introduction of the restaurant's cuisine. Because of the progressive spirit and style of cooking at Mugaritz, he enthused us to keep an open mind. During this chat we enjoyed the first bite of the afternoon: kokotxas coated with an elegantly spicy, dehydrated mole powder. Once back in the dining the room, our Mugaritz journey really began. 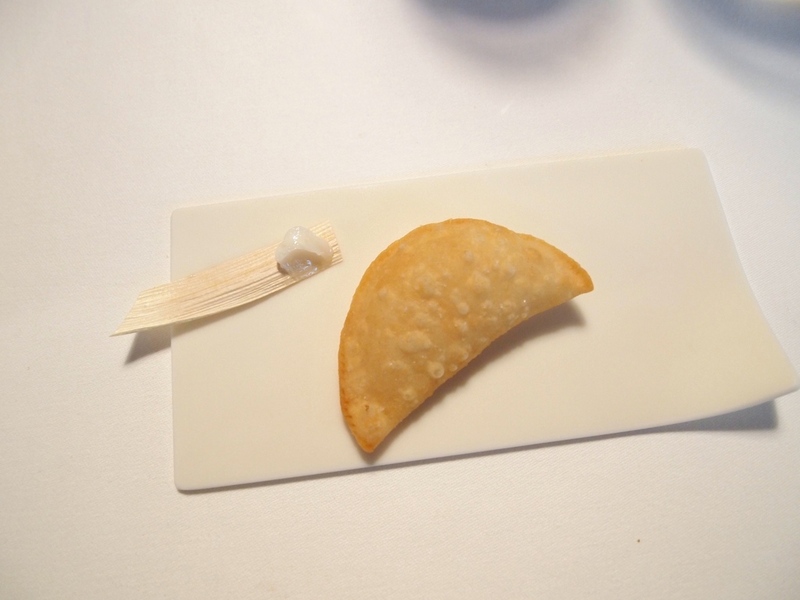 The tasting menu this afternoon contained 24 courses, falling apart in a beginning, a middle and an end. The beginning was a succession of eight small dishes (or sometimes just bites), arriving at short intervals in a little more than half an hour. 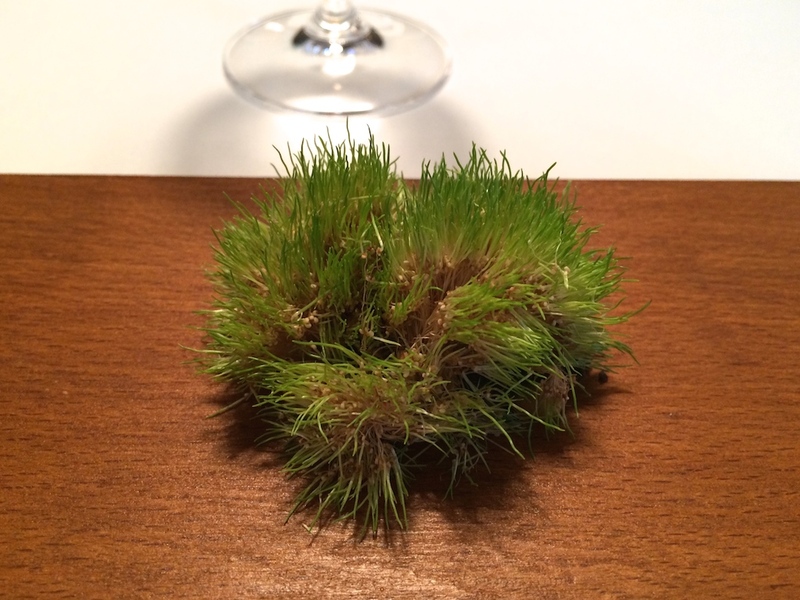 Tot start there was a dish called "A handful of Highland grass". Highland grass is type of African grass and its fine grains are also known as Teff. Here a small "divot" of delicate Teff sprouts was served with some crunchy mini cocoa balls and a rich and pure hazelnut paste, the latter resembling the colour of dark brown Teff. A lovely combination, the hazelnut paste adding a nice buttery touch. Next up was "Walnut omelette", a wonderfully soft and fluffy walnut tortilla and some sliced fresh spring mushrooms served on a piece of ultra-crisp "crystal" toast. A delicious bite with elegant woody flavours and a great textural contrast. 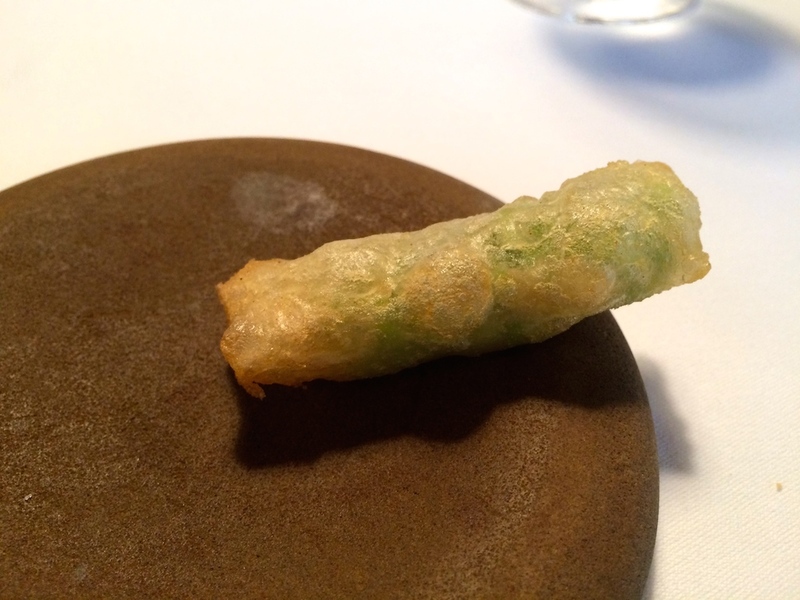 Even better was the next, technically adroit, bite of delicate raw Guisante Lágrima peas, also known as tear peas, deep-fried in a thin and light tempera batter. After you bite through the crisp batter you are hit by the wonderful grassiness of the peas; superb. Then there was some grilled fennel complemented by a lovely goat's cheese dip. This was quickly followed by a magnificently presented dish: a crunchy lacquered duck neck cylinder filled with fresh herbs and sweet corn. An original and flavoursome combination. Shortly after we were served a deep-fried empanadilla (just the casing, no filling), instructed to be smeared with some accompanying pork fat. Simple but delicious. 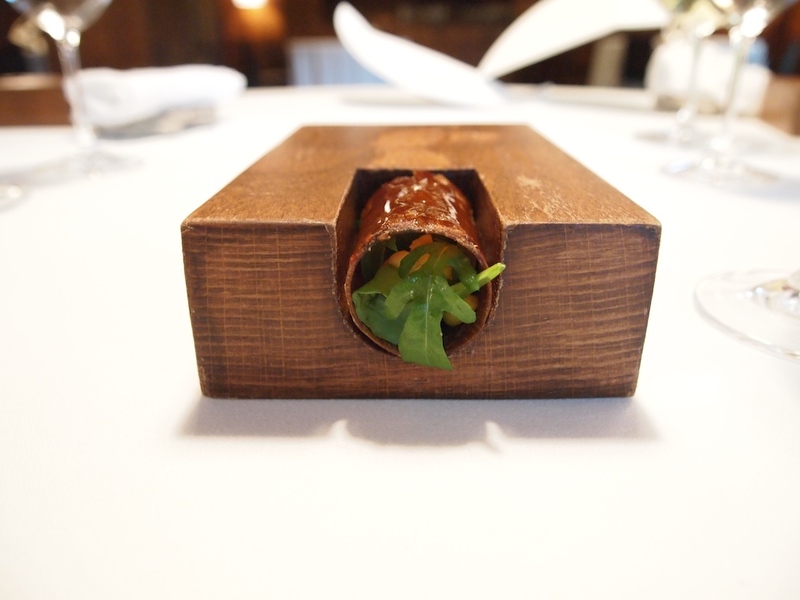 Next in line was a sticky and chewy pork cylinder filled with soft and rich Iberico pork tail stew and wood sorrel leaves. This was quite a powerful bite with incredibly distinct pork flavours. 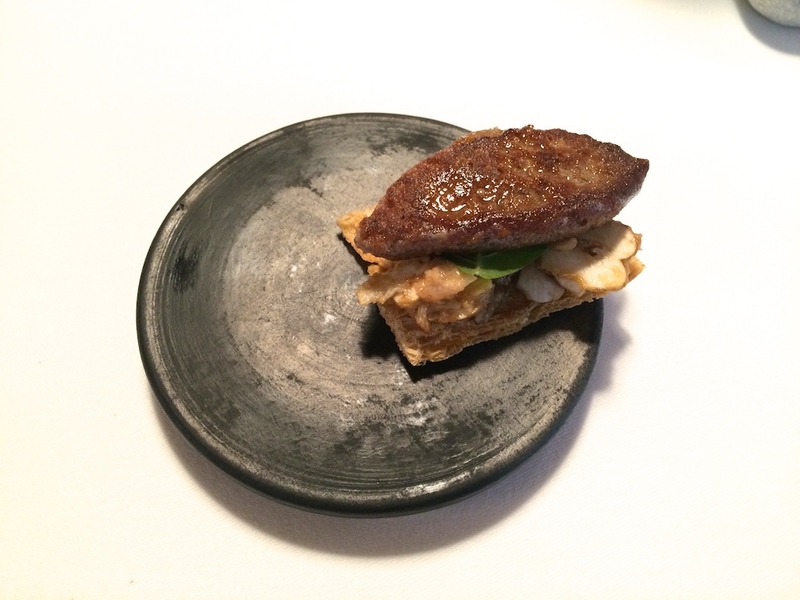 The final piece and eighth course was a beautifully made rooster comb and spider crab "sandwich". The sandwich is made with actual rooster combs (cooked and then dried), its textures being crunchy and slightly sticky. The coral filling had been seasoned with pimenton, delivering a lovely touch of spiciness that lingered on the palate. An outstandingly creative dish. 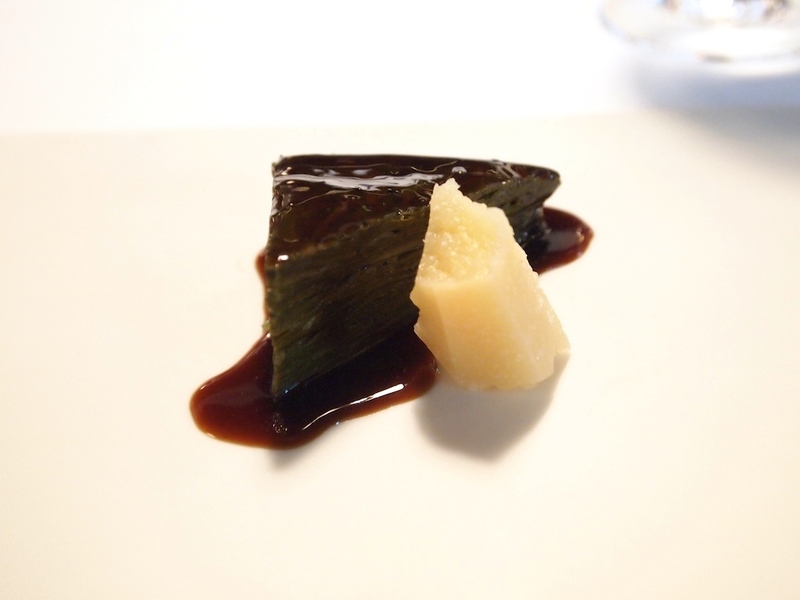 A couple of minutes later the first dish of the middle section (11 courses in total) of the menu arrived: "A thousand leaves", a mille-feuille made up from chard leaves blanched in a beef reduction, served with a piece of Idiazabal cheese. A surprisingly rich and seductive pairing with tons of flavour. The beef reduction added a beautiful shiny and sticky glaze to the chard leaves and mellowed their bitters, but at the same time it kept the characteristic natural flavour of the chard intact. The addition of the cheese added a nice salty contrast. Tenth course was "Oyster in escabeche". 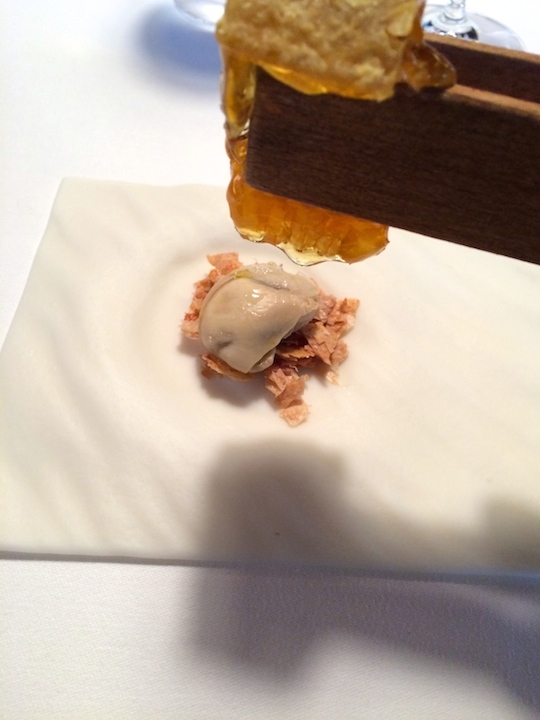 A firm and creamy oyster placed on top of some pork "flakes" was served with fresh honey, to be squeezed straight from the comb. I don't think I had had oysters with fresh honey before, but the flavours didn't clash and I liked how the honey intensified the meatiness of the oyster. That said, even though there was still a hint of brininess in the aftertaste, the oyster wasn't able to cut through the sweetness of the honey completely. 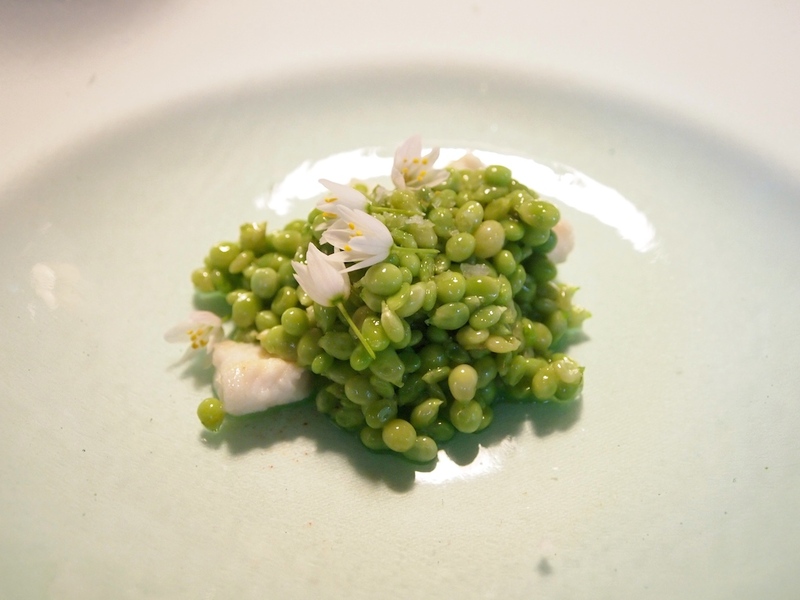 A better partnership was formed in the next dish by small pieces of conger eel and warm and crunchy Guisante Lágrima peas, coated with a wonderfully rich and gelatinous sauce, and garnished with garlic flowers. Lovely elegant garlic flavours from the flowers and the fresh peas delivered a pop of light spring sweetness with every bite. A delightful combination and the addition of the meaty eel completed the dish. On to the next course: steak tartare, very finely chopped by hand, mixed with sea bream roe and topped with Per Sé caviar from Yesa Navarra. 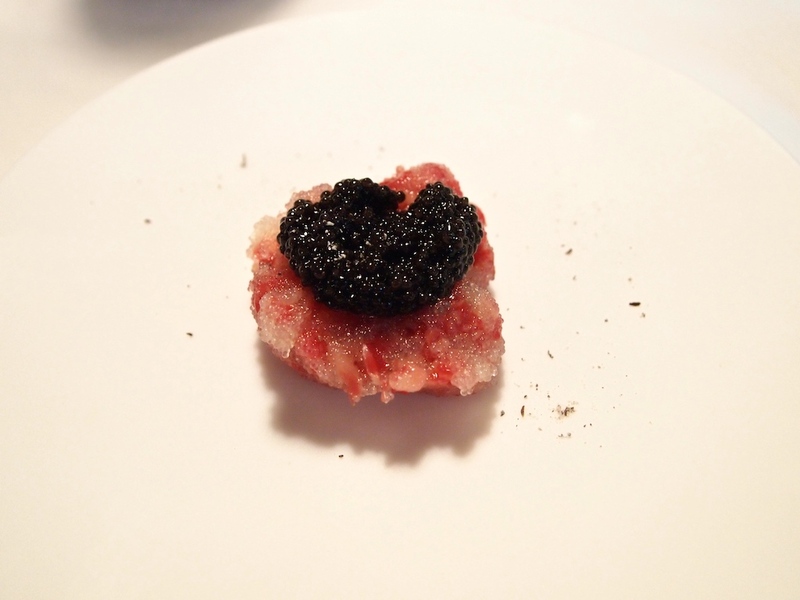 The delicate beef was ever so slightly overpowered by the roe and caviar, but otherwise this was a good dish with lovely textures that created a wonderful mouthfeel. Mackerel, beetroot and horseradish followed. 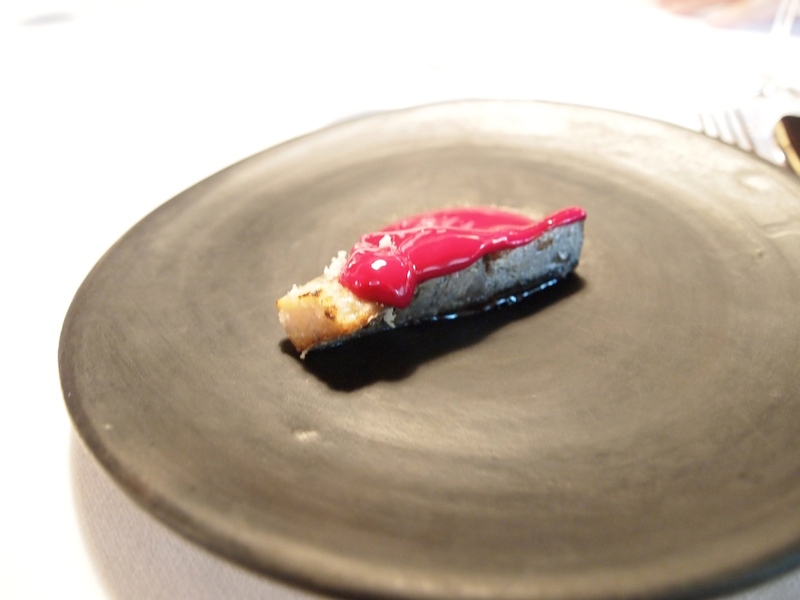 The mackerel is first cured and then cooked over coals, sprinkled with freshly grated horseradish, and served with a bright pink and delicately flavoured beetroot Kvass emulsion/fermentation. Hidden underneath the sauce was some land cress, which added a nice and pungent touch. A perfectly balanced dish and the moist and smoky mackerel was superb. 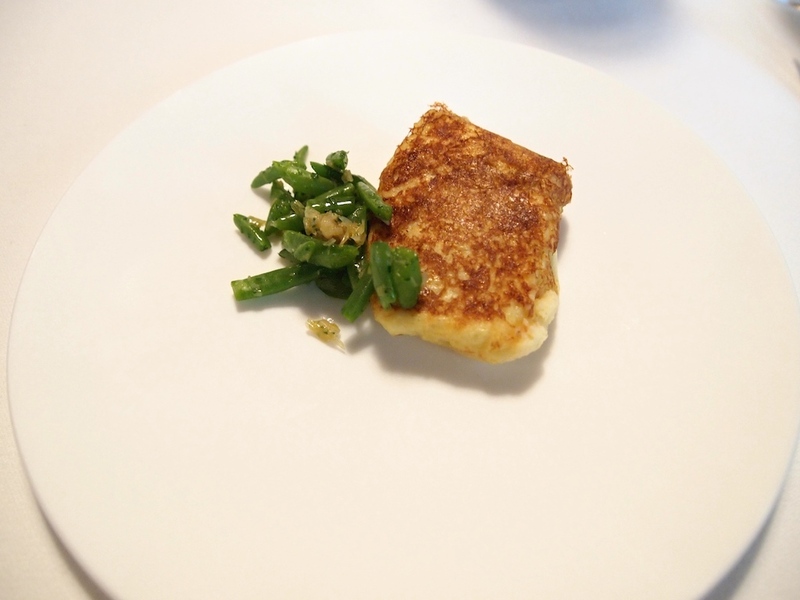 Equally good was a thin and fluffly omelet filled with a soft potato puree (made with potato, cream, egg, and kuzu starch) and a wonderfully juicy and meaty oyster, accompanied by some green beans and a caper berry to add some texture. A simple assembly of bold and bright ingredients, delivered in an elegant fashion. Best of all though was the fifteenth course, "Bovis máxima: vive la France! ", a dish based on some of the classic flavours/ingredients in French gastronomy: butter, bone marrow, tarragon and demi-glace sauce. 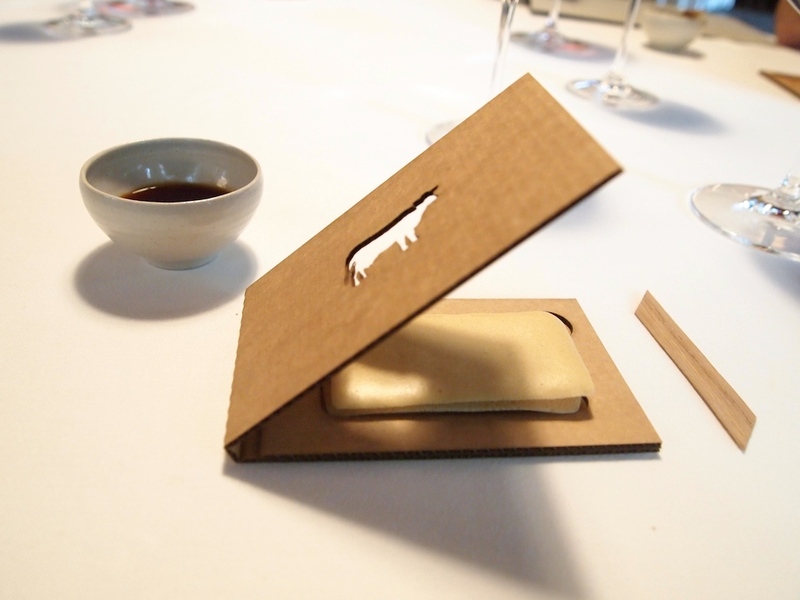 Inside a beautifully made cardboard cover was a crisp sandwich with a creamy bone marrow filling, elegantly seasoned with tarragon. A small bowl of demi-glace sauce was served on the side. The idea was to enjoy the sandwich with some demi-glace sauce brushed on. An extraordinary combination of flavours and textures: I particularly liked the fatty texture of the sandwich filling, and the demi-glace sauce was fabulously intense, with a pleasant sweetness and wonderful veal flavours coming through. The meal continued with "Glutinous hake". 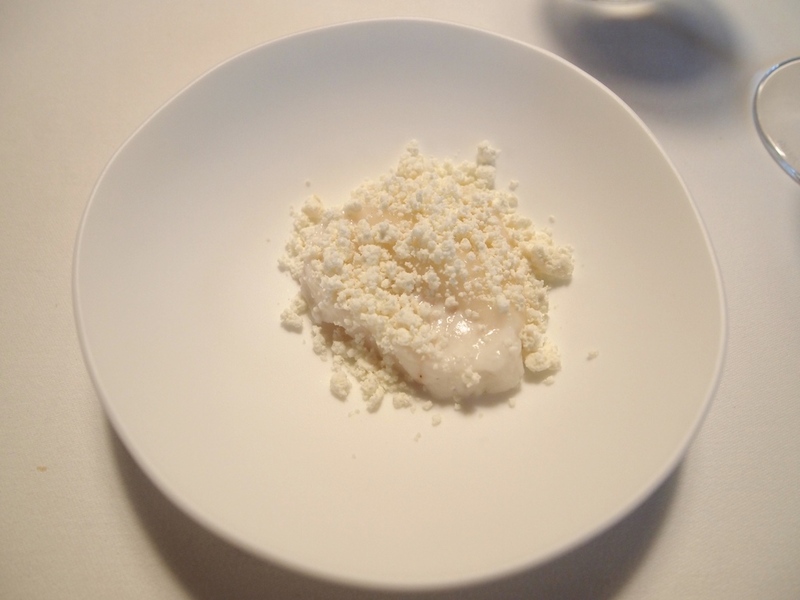 Slow-cooked soft and tender hake was served with some crumbly fresh cottage cheese. So far a lovely dish, but I wasn't too keen on the glutinous bit, which turned out to be a rather bland and sticky substance (made with rice?). After the hake two lamb dishes followed. First to arrive was a beautifully roasted, halved bulb of garlic, glazed with a lamb jus reduction, which we were instructed to squeeze over a piece of grilled toast. The end result was a messy but delicious and certainly intense flavour experience. 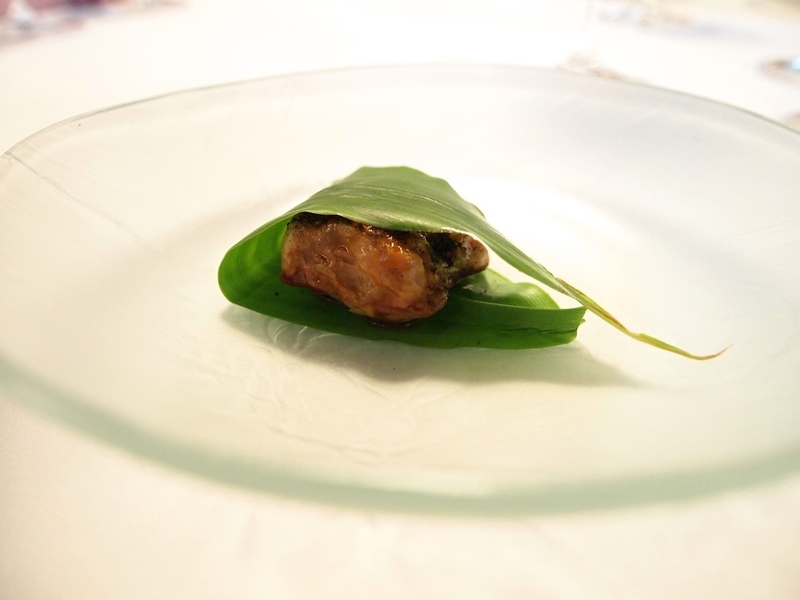 Shortly after, this was followed by "Glazed mille-feuille of lamb", a very creative dish of crisp lamb belly served in a Myoga leaf. A well-executed dish with intense lamb flavours. In fact it was a bit too strong for my taste, but I'd like to point out here that I'm not a huge fan of lamb in general. The next dish was a marvellous example of sensory incongruity, a gigantic beef-flavoured haribo, and it certainly messed with my tastebuds. 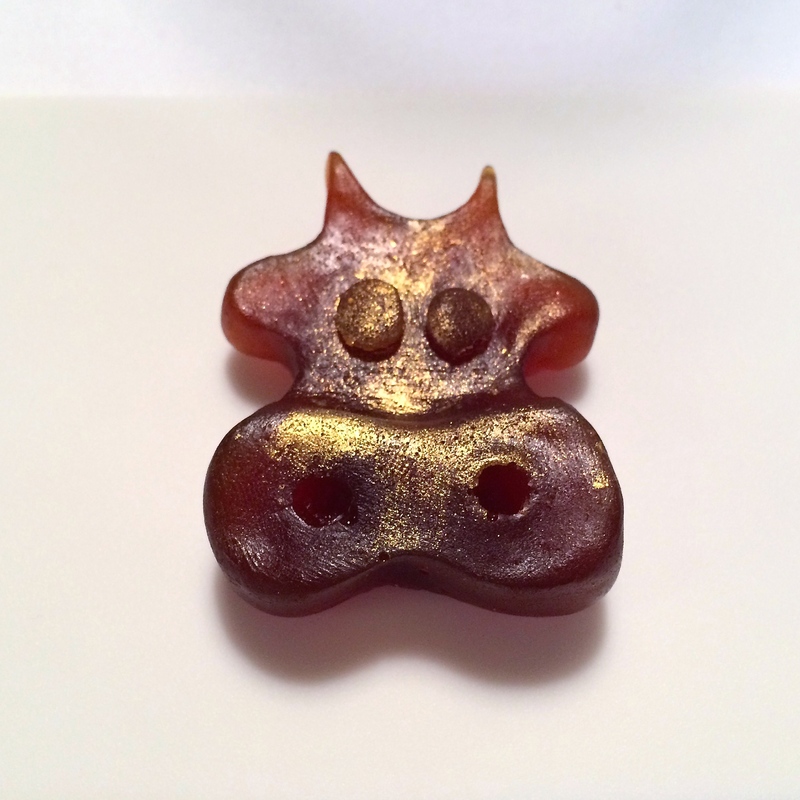 The beef haribo is made from beef stock, mixed with a sweet wine and sugar syrup and some beef fat. Sensory incongruity is about flavour expectations: the brain registers red-coloured candy, so we expect sweetness (red fruit perhaps), but instead the palate tastes beef. Luckily I was told beforehand the haribo was beef-flavoured, but there was still this surprise element once I put the "candy" in my mouth. Obviously this was a highly unusual flavour/texture experience, but I couldn't fault it. Last in this line of eleven dishes, was beef excellently paired with a hazelnut praline sauce, and garnished with allium leaves. Superbly cooked beef (from a retired dairy cow), tender on the inside and with great, crisp caramelisation on the outside. Once combined with the hazelnut sauce, there was this sublime, creamy, satay-like flavour sensation. An effortlessly striking dish that delivered real pleasure. After this we moved towards the final stage of this lunch, served in five sweet and savoury courses. 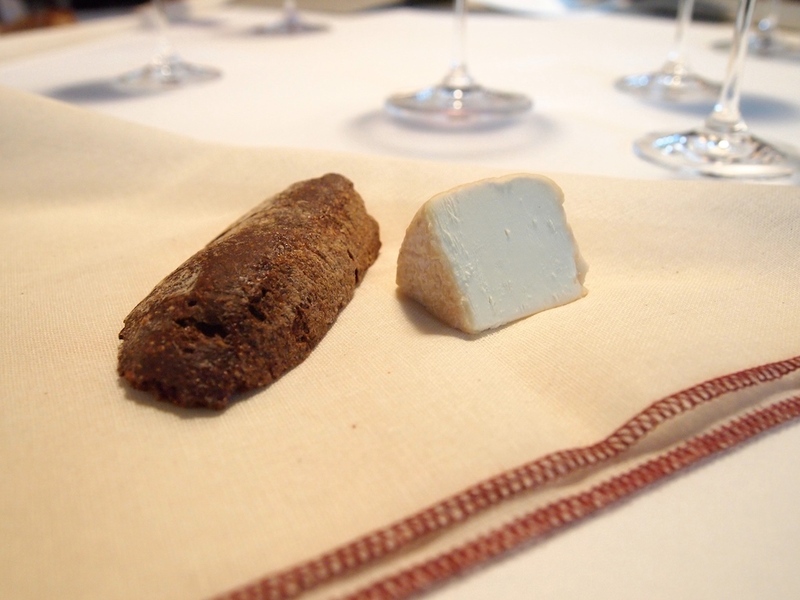 To start there was a simple cheese course of crusty bread with local goat's cheese. This was followed by a sensational toffee and cod cake: the toffee was elegantly sweet and sticky, and the cod was silky, sweet, buttery and wonderfully intense. A fabulous pairing, that, in a way, reminded me of blackened cod, but then served as cake. Flavourwise the third and fourth desserts were more traditional. 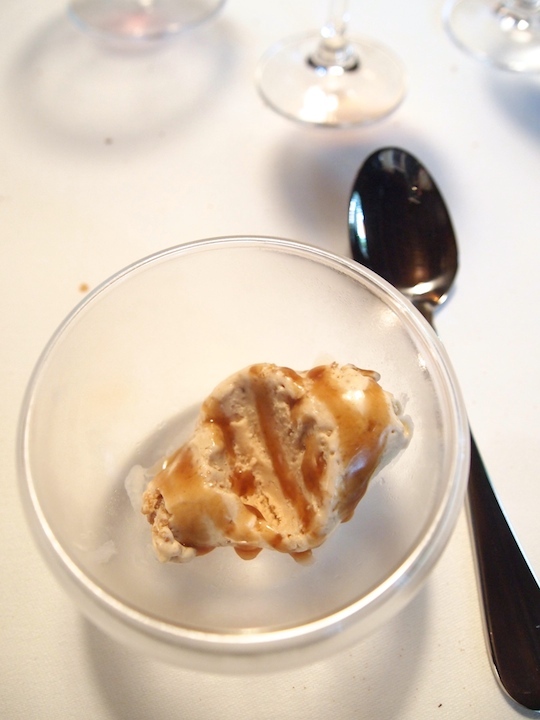 There was a delicious crisp and sugary nut wafer sandwich with a light and nutty crème filling, followed by a wonderful peanut ice cream dessert served with a peanut caramel. Well-made smooth and creamy ice cream with just the right level of peanut flavours. 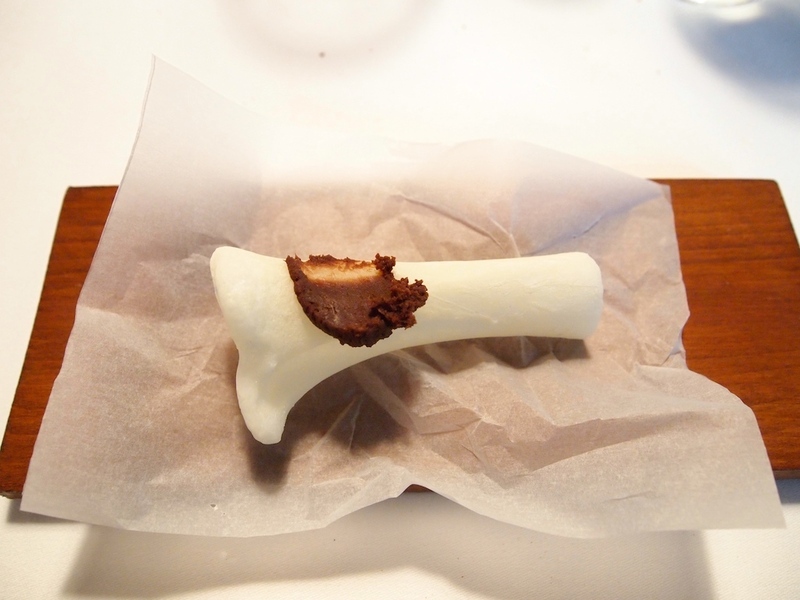 And we went out with a "bone", a sugar bone with some delicious chocolate and cured ham paste smeared on. "Seven Sins" sweets and chocolates, served with our coffees. 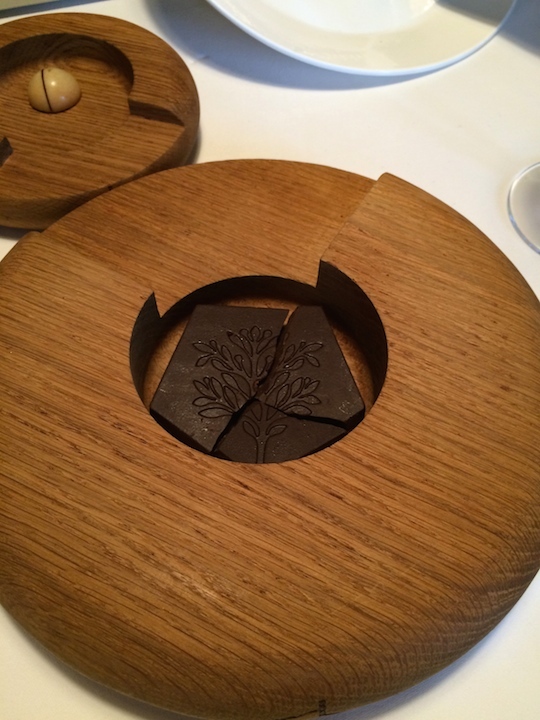 Lunch at Mugaritz is like a ride in a fun house, and after four hours of surprise, excitement, bewilderment, confusion, entertainment, relief, and pleasure, I left the restaurant in unexpected admiration. Why unexpected, you ask? 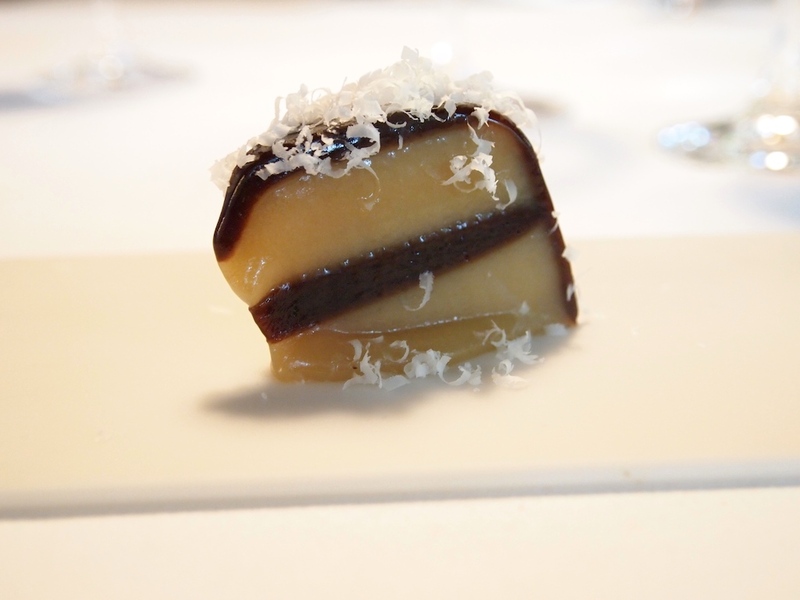 Well, the experimental style of cooking at Mugaritz undoubtedly leaves nobody indifferent. Serve today's menu to a table of 10 (or better yet, put the diners in cubicles to avoid the "chameleon affect") and you will probably get 10 different opinions, ranging from gastronomic shell-shock to complete and utter pleasure. I honestly didn't know what to expect and where I would end up on the scale from shell shock to pleasure. 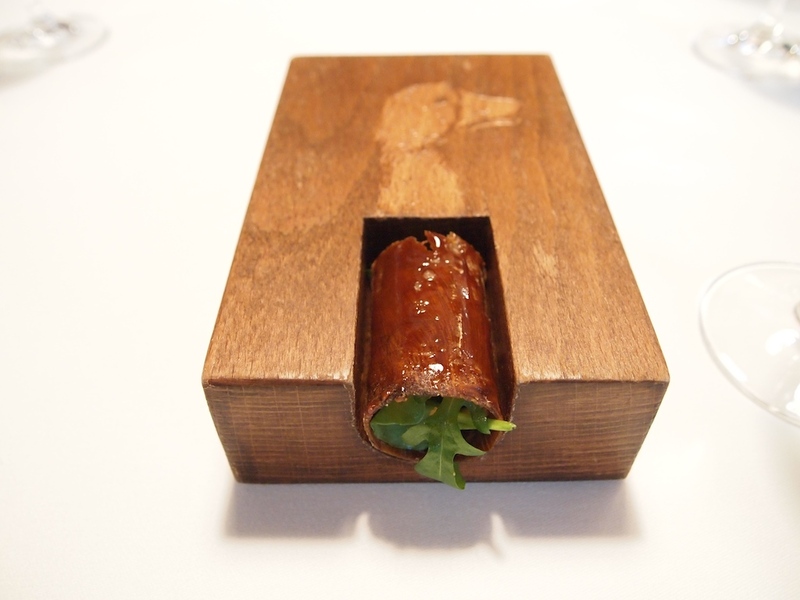 Mugaritz is a restaurant that runs on a different kind of petrol than the average high-profile Michelin starred or World's 50 Best restaurant. Here the creative team spends up to 11,000 hours on developing new dishes and in some years the restaurant serves some 100 different dishes to their guests (in 2015 there will be around 50). Today's menu was magnificently curated and displayed fastidious attention to detail and imaginative and innovative cooking on all levels. Here multisensory gastronomy is no longer a novelty nor a gimmick, but a deeply ingrained ethos. 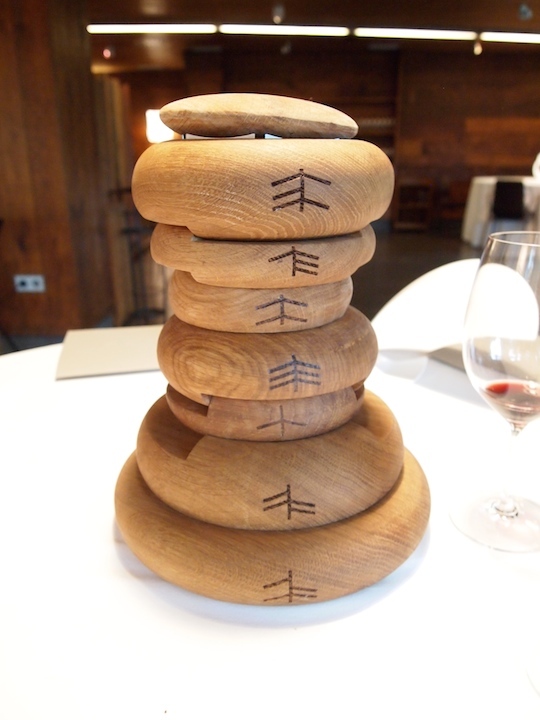 Mugaritz employs every technique that is available to the modern chef, and the food they produce is their own, individual take on modernist gastronomy. "People inhabit separate taste worlds" (Linda Bartoshuk, 1980), so whether you will personally enjoy riding the whirlwind of a meal at Mugaritz, I cannot possibly predict. But surely no one can blame this restaurant for being what it wants to be.